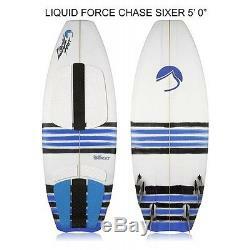 SIXER WAKESURF BOARD 5'0. Sixer Wakesurf Board is a board with lively pop for high ollies. The Sixer is full of performance from the added rocker to the tip and tail. Six fin boxes allow you to experiment with the board's playfulness. Setting it up as a twin or quad makes for fast and responsive turning, while a looser ride can be achieved by adding in the stubbies. Switching up your fins will maximizes your versatility and engages riding responsiveness. Plus, the EVA foam traction pads will give you the confidence to throw up the "shocka" to your buddies on the boat without slipping out. Sixer Wakesurf Board will have you shredding to the next caliber. EPS Core / Epoxy Shell. A polystyrene (EPS) core is hand finished with epoxy for a durable and smooth finish. 2.2" Nose / 1.1" Tail. 2.3" Nose / 1.2" Tail. 2.5" Nose / 1.3" Tail. Speed, flow and amazing thrust through the tail. Blunted and wide nose channels add control. Multiple fin-boxes make for a versatile and customized board. Eva foam traction pads help a rider grip the board. Integrated within the pads are Archbars and Kickstops for higher ollies and comfort. The item "LIQUID FORCE SIXER WAKESURF BOARD 5'0" is in sale since Monday, November 28, 2016. This item is in the category "Sporting Goods\Water Sports\Wakeboarding & Waterskiing\Wakeboards". The seller is "wakesidemarine" and is located in Elkhart, Indiana. This item can be shipped worldwide.